As a business leader, what would be the impact if your team was 100% engaged? The good news is that the percentage of employee engagement can be improved in any company. So, if you are not thinking and strategizing about how to drive higher engagement levels, you’re missing out on the easiest and least cost way to grow your business. 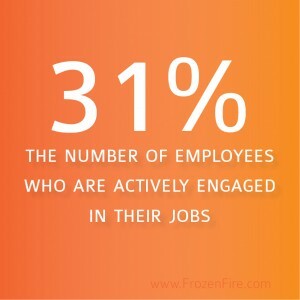 In a recent research study, only 31% of employees were actively engaged in their jobs. These employees work with passion and feel a profound connection to their company. Engaged employees tend to have an emotional bond to their companies and are motivated by values such as personal growth and working to a common purpose rather than just remuneration. Striving for 100% employee engagement is complex to say the least, but there is a starting point that most companies overlook. The impact is enormous, and it is free for the taking. The answer to these questions impacts branding, competitive differentiation, communications, and ultimately the successful implementation of your business strategy. Why Do We Exist And What Is In It For You? Have you ever asked yourself at a personal level: Why do I exist? I suspect that most people have not asked themselves this question based on the number of people I have asked recently and the weird look on their face when I pose the question. The question is quite difficult to answer and requires a great deal of thought. Coming up with an answer that will guide you in life is very challenging. The reason one would do this is to give purpose and meaning to your life and keep you centered on what makes you happy. One could also say that the same introspection would also be valuable for your business. Yet very few businesses today focus on the question, “why do we exist?” and then internalize it into all aspects of running a business. Wikipedia has a definition for the term mission statement that I like; “A mission statement is a statement of the purpose of a company, organization or person, its reason for existing.” So I did a random look at 60 mid-size company websites to see if they had a mission statement, and if that mission statement had an answer to “why we exist.” Of the 60 companies I found only three that had a statement that resembled an answer to why they exist. The most notable of which was Aquire Inc. Aquire’s About Us page states: “True Wisdom Comes From Within. At Aquire, we believe in the power of knowledge, the benefit of visibility into critical information, and the collective wisdom born from experience combined with collaboration.” This statement does not quite explain the reason they exist, but they clearly tell you what they believe, which is very important as well. I believe that defining why a company exists is the biggest opportunity that a CEO has these days, and it is virtually untapped in most companies. The most obvious example of a company that gets it is Apple, Inc. but more about them later in this article. Let me first give you an example of a company not so well known. I have the good fortune to be a friend of the Chairman and CEO of Rent-A-Center whose company I believe is a shining example of a well run, highly profitable and forward-thinking organization. They are a very health company no matter how you do the analysis, and they have grown from a mid size company 25 years ago to a $3B organization today. The company’s mission statement is clear, easy to remember, and states the reason they exist: “To Improve the Quality of Life for Our Coworkers and Our Customers.” They hire people who believe what they believe. When you hire people who believe what you believe, they will be inspired, loyal, and positive contributors to the goals of your company. The reason why you should care about “why you exist” is that decision-making is an emotional function of the brain as proven by numerous neurological studies. People don’t buy what you do; they buy why you do it. People are attracted to companies who believe what they believe. Can you imagine how your company will grow when everyone is pulling in the same direction? There is a great video by Simon Sinek on Ted Talks that goes into analysis of why great leaders inspire action. In this video, Simon talks a lot about Apple and how they differentiate themselves in the computer industry. According to Simon, he has codified how great leaders tend to think, act, and communicate in the exact same way; and, the complete opposite of everyone else. Simon calls it the Golden Circle. The Inner circle is the WHY (as in why do we exist), the middle circle is the HOW, and the outer circle is the WHAT. He makes the case that inspired leaders communicate from the inside out drawing first on the emotional level of the audience. For example, at Apple, they communicate that they believe in challenging the status quo and that they believe in thinking differently. Apple claims that the way they challenge the status quo is by making their products beautifully designed, easy to use, and user friendly. I might also add that Apple produces the most expensive computer products on the market, and they are able to command this premium because Apple customers are emotionally attached to Apple products, and they buy into Apple and why they exist. Need another reason? How about Customer Engagement? With the expansion of social media, a true business opportunity is emerging for those companies that focus on communicating from the inside out. In an article by Brian Solis entitled How Social Media Can Spur Organizational Transformation, Brian champions the idea that “adoption of social media isn’t just important; it’s now becoming homogeneous in its incorporation into the enterprise. What most fail to recognize is that social media is a series of channels that facilitate a more dynamic form of person-to-person connection and discovery through a powerful undercurrent of two-way engagement. Social isn’t just technology, it must become part of the corporate DNA.” Unfortunately most executives do not get social media and its impact on not only customers, but prospects and employees. Today’s executives need to become educated and incorporate social media into their communications strategy both internal and external but from the inside out.